Sometimes I think about the things my family eats for dinner, and it makes me laugh. I've said before how many times my mom has come to my home to babysit or stay for a while, and she always comments on the strange ingredients that have become staples at my house. Fish sauce, 3-4 different curry pastes, black bean paste, sriracha sauce, pesto, and the list goes on and on and on. I've had this discussion with James many times how the most exotic meals we had as kids growing up was hard shelled tacos with orange shredded cheese every Weds. night. This is by no means intended as a slight to my mom or James' mom. That was all that was available at the time. When you had a salad it was with Iceberg Lettuce. Now I have so many lettuce options just at my local small town grocer it's crazy! The world has become so small. My family can eat from 3-4 different countries without even having to order take out. I can make it in my own home. 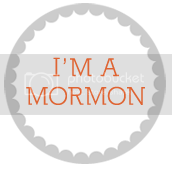 My brother-in-law Dave served an LDS Mission to Thailand and is the person I credit with my family's love of Thai food. He's the one that showed us how simple making these dishes at home could be. He introduced James and I to our first Thai restaurant as well. I remember Dave making this salad on a beautiful summer day on the beach at Bear Lake. Out of the tailgate of his Suburban he threw together this salad in a Ziploc bag, and we feasted! It was so tasty! I will say that finding green papaya IS a little tricky. I have a favorite Thai Food Market in Ogden that always has green papaya, and sometimes you can buy bags of it pre shredded. 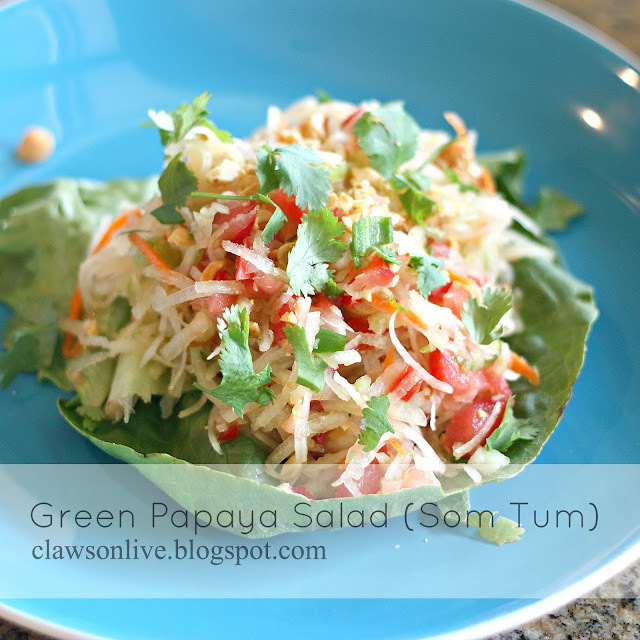 If you don't have access to green papaya (And regular papaya isn't the same. Sorry!) you could substitute shredded cucumber, or shredded cabbage for a Thai Coleslaw version:) This salad is best served with Thai Sweet Sticky Rice, but regular Calrose, or Sushi rice would work great. It's great served on its own as well. It's raw, and fresh, and full of really great flavors. Enjoy! sugar to taste- I used about 1/8 c.
About Green Papaya: You may be able to find an unripe papaya in your local supermarket - it should have greenish-orange to green skin. If not, the best place is an Asian food store or market. It should be firm on the outside; inside flesh will be white to light orange. Add sliced tomato, spring onion, chili/cayenne, basil. Pour over the dressing, tossing well to combine. Add nuts and toss again. Taste-test the salad. If not sweet enough, add a little more sprinkling of sugar. If not flavorful enough, add a little more fish sauce or soy sauce. If too sweet or salty, add more lime juice. Add more chili for a spicier salad. To serve, scoop into individual bowls or onto serving plates. Top with cilantro and a sprinkling of more nuts. Serve immediately with rice or on it's own and ENJOY! Jeff, can you level me to a number of the Tribulus studies? I would be very intrigued in reading through them.